This is the ultimate ‘not feeling well’ soup. This colourful mixture of simple but wholesome ingredients can help you overcome almost any ailment. This soup is a goldmine of sustenance, including one vegetable that is truly a nutritional hero. The carrot can be orange, black, pink to red, yellow and white, this delicious winter vegetable is within reach of rich and poor alike and deserves to be dubbed the universal root. This culinary offering will be the perfect complement to the mind bending and visually arresting creations present in Celestial Soup. These elements have been carefully garnered from the world of orbiting mayhem that surrounds us all and are outlined in more detail below. Julian King deals with the space and time zone of the quotidian. The burnt out retinal scarring of an object stared at in harsh sun light or a carefully folded piece of paper unfolded and forced into abstraction. Time warping constellations of parts orbiting each other that will never again make a whole. Never be fixed. Skewed fragments that serve as blue prints for a machine that will not be constructed or re-constructed. David Micheaud creates post-apocalyptic vistas and focused abstractions on the ephemeral that form haunting yet strangely familiar visions. These observations are both beautifully rendered versions of reality and threatening in their desolate desperation. Karolina Mikeskova has been contemplating the movements and conceptual value of Erratic Boulders. These lumps of inert rock are carried around by glacial ice and often end up settling amongst Rocks of a different type. Karolina has been carving out her own versions of these wandering rocks that by their very nature are on a conceptually absurd journey around the globe settling alongside objects and materials from a myriad of species. Robert Pratt will prepare and cook a celestial vegetable soup. Alongside this Pratt has created a sonic pocket of draped tie dye, generating an intense and absorbent studio atmosphere. These drapes will literally soak up the sounds pulsed towards them and the smell of the celestial soup with impregnate the fibres of these psychedelic wall hangings. These cloths will serve as receivers, loosely hanging around and soaking up the information thrown at them. Entschuldigung – A noise scape generated with analogue synthesisers and spliced tape loops. Dark waves of drones and tones pulse, underpinned by glitchy beats that give way to redemptive moments and run away melodies. 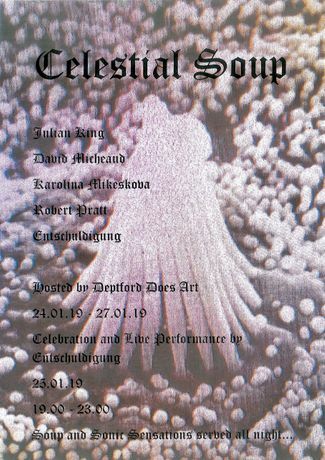 Entschuldigung will release a limited edition run of 50 double cassettes at Celestial Soup. CONVERSION has been professionally dubbed onto superferric music high grade tape with hand numbering on the J-card insert. Conversion was recorded by Jim Wallis at Bella Union Studios and will be released on Rat Run Records 25-01-19. All works are for sale POA.